Have you ever played the first Community Group Levels, like CGL1 and CGL3? Well, I hope you do, because it's time to start another LE CGL! Since we wouldn't have to deal with Constructor clutter and other shenanigans, this CGL could allow more players to join in and create their parts! Take your time, make your part fun! Please use MBG interiors only; some custom MBG interiors are allowed, just let people know which ones you used. Since this a MBG-styled level, please don't use any of MBP/PQ's shapes or triggers. At the start of your part, insert a help trigger, similar to the ones in previous CGLs (Name's _________). Please do not edit anyone else's part or have your part interfere with them (unless you're me). When you're finished your part, post the level on this thread, or DM it to me, so the next can continue it. Since this is an MBG LE CGL, it should be playable in Vanilla MBG. Eight sections have been created. Last edit: 01 Jan 2019 22:48 by blueoatmeal. I'm definitely gonna join. Working with only MBG is gonna be a bit of a challenge for me, but I can handle it. Can't wait to start working on my section! I'd love to join! This will be such an excellent opportunity to contribute to this project as I have never used Constructor throughout my entire life. Last edit: 30 Jul 2018 03:43 by Nutmegg. I knew that; what I meant was that I only use the level editor to make a few of my levels, and no requirements of using Constructor is such a plus for me. It's been a long time since I made any LE levels... I'll join. Last edit: 31 Jul 2018 08:24 by 9thDimension. I am gonna join in! How long should each part be? wow! it's avi! it would be an honour if you joined! be my guest! Last edit: 01 Oct 2018 23:19 by blueoatmeal. Here's a link to the old MBG CLA which has all of the MBG interiors from however many years ago. Thought it would be helpful to include. Alright we got one section completed! If anyone wants to continue with what I currently have, please reply. I want to release this CGL before New Year's. Remember to build in Vanilla MBG's LE. No PQ, please and thank you. 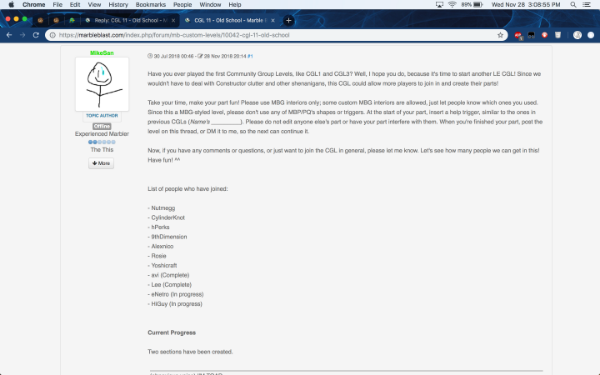 I'm sorry, but if you are going to change the rules after everyone joins, I will not be contributing to this CGL. The original post mentioned NOTHING about using MBG's LE. I'm also uploading a picture of the first post to show that you mentioned nothing about using MBG's LE in case you decide to edit that into the post. EDIT: Thank you, forum software, for making the picture ridiculously blurry. You can ask me on Discord for the screenshot. EDIT 2: I will gladly contribute if you revoke the highly restrictive rule that you enacted long after everyone joined. Last edit: 28 Nov 2018 21:14 by CylinderKnot. Last edit: 03 Dec 2018 17:31 by blueoatmeal. NOTE: I use the road.dif, which is located under interiors, for my part. I'm finished with my part. Please submit your parts or message me if you cannot submit it at this time. As for people who are anticipating the release of this collab, we appreciate your patience. Last edit: 08 Jan 2019 23:33 by blueoatmeal. After three months of building, we have finally finished our project! It is my pleasure to present to you CGL 11 - Old School! Special thanks to everyone that contributed to the project. Avi, Lee, eNetro, Yoshicraft224, Xedron, Alexnico, CylinderKnot, HiGuy, thank you for participating! I hope this will be worth the wait. Please enjoy! On one final note, I'd like to dedicate this level to IsraeliRD, a marbler that has been with the community since the very beginning. He also participated in the early LE CGLs, which was what inspired me to start this one. Thank you for everything, Matan! If you have the time, I'd like you to play it. Last edit: 20 Mar 2019 02:33 by blueoatmeal. Update. Added checkpoints, fixed gem tally and reworked interiors. Remember that all interiors go into data/interiors. Updated again. A few players and I agreed to remove Yoshicraft's part. Last edit: 20 Mar 2019 02:31 by blueoatmeal.